A.Vogel Echinaforce + Vitamine C 45 tablets order online. 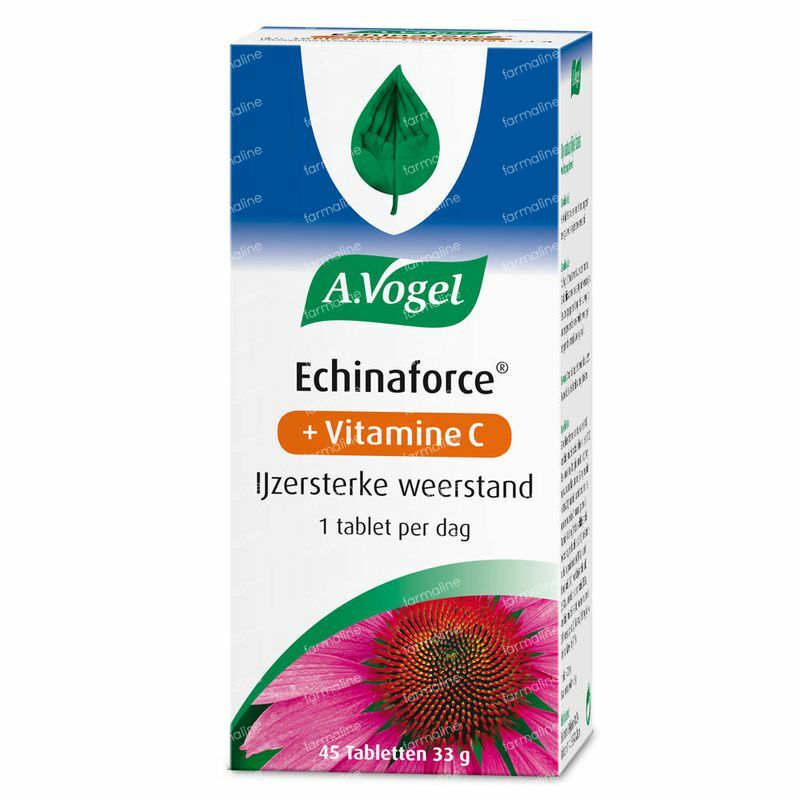 A.Vogel Echinaforce + Vitamin C tablets each contain 60 mg of natural vitamin C, obtained from the Malpighia punicifolia fruits. This fruit is known as one of the richest natural sources of vitamin C. Vitamin C is necessary for a strong immune system. It is also an antioxidant that, just like vitamin E for example, provides protection for our body's cells. Vitamin C strengthens your immune system, promotes the absorption of iron from your diet and plays an important role in maintaining healthy bones, teeth, vessels and other body tissues. People that smoke also need more vitamin C than non-smokers, because smokers break down more vitamin C in the body. A strong immune system is necessary to stay in good shape. The better your immune system, the fitter you are. Moreover, with a strong immune system, you are more likely to recover faster after having been ill. The Echinacea purpurea is known for its positive influence on the immune system. It is this plant that forms the basis for Echinaforce + Vitamin C.
Vitamin C is an essential vitamin for the human body. It increases the immune system and promotes the absorption of iron from your diet. Vitamin C is also an antioxidant. Therefore, it contributes to the protection of healthy body cells. 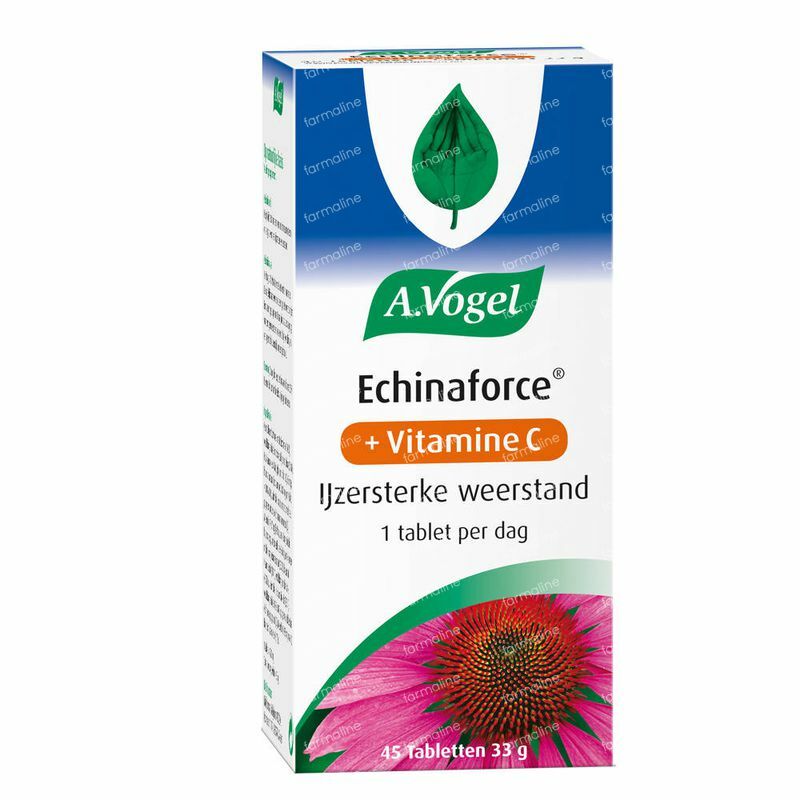 With one tablet of Echinaforce + Vitamin C you can boost your immune system and get 75% of the Recommended Daily Allowance of Vitamin C.
Modified starch: maltodextrin, thickening agent: microcrystalline cellulose, Brazilian cherry (Malpighia punicifolia L.) 60 mg: source of natural vitamin C (60 mg per tablet = 75% RI for vitamin C), filler: sodium croscarmellose, purple rudbeckia (Echinacea purpurea (L.) Moench, herba et radix) 1210 mg, thickening agent: hydroxypropyl methylcellulose, anti-caking agent: magnesium stearate, colouring agent: titanium dioxide, thickening agent: talc, flux: silicon dioxide, thickening agent: PEG-6000, colouring agent: iron oxide. Children under 12 years of age. If there is hypersensitivity to any of the components. In general, you can use this product simultaneously with other products. In case of doubt, it is recommended to consult a doctor or pharmacist. The product is generally well tolerated in the recommended dosages. Store in a dry place, keep away from light, do not store above 25ºC. Best before the end of the month indicated on the top of the package. Do not exceed the recommended daily allowance. A food supplement should not be used as a substitute for a varied and balanced diet and a healthy lifestyle. In case of complaints, it is recommended to consult a doctor. Great product! A necessary complement of the amount of vitamin C, especially during the long winter. We are very happy with this product. I use this product from late September until usually March when the winter is almost over and I survive it without diseases. Maybe once a flu and that's all, TOP products of Dr.Vogel. I take this for years during the winter, especially when the fatigue and lack of light emerges. I have recently had a bad cold and when I take this, I get rid of it faster.